People like web pages that load quickly. Google experiments show that a delay as small as a hundred milliseconds can have an adverse effect. But how do we measure web page load speed? And what does "page load" actually mean? This article describes the API and shows ways to make use of the timing data it exposes. timing: data for navigation and page load events. Type in the word performance next to the > prompt at the bottom of the window and press return. Click Performance to see the properties of the object: memory, navigation and timing. Click the arrow to the left of timing to view its properties. Sorry, this section is not supported in your browser. On a web page, use the <!doctype html> directive to ensure the document is displayed in Standards mode. In the developer tools console, you may need to adjust the browser or document mode. Unless you're happy to leave timing code in a page, you won't be able to measure load speeds as experienced by your users. Worst of all, the Date object can't be used to measure network latency before the page began to load. Each performance.timing attribute shows the time of a navigation event (such as when the page was requested) or page load event (such as when the DOM began loading), measured in milliseconds since midnight of January 1, 1970 (UTC). A zero value means that an event (such as secureConnectionStart or redirectStart) did not occur. The meaning of these events is described in Microsoft's performance.timing documentation and more formally in the W3C Recommendation. Internet Explorer 9 supports all the attributes described in the API draft except secureConnectionStart, and in addition provides the msFirstPaint event which occurs when document display begins, after loadEventEnd. Below is a dynamically generated timeline of all the performance.timing events that occurred in navigating to this page and loading its content, normalised to start from zero. Hover the cursor over each item to see the exact event time. Note that the loadEventEnd event did not occur in this case, because the page was still being loaded when the timeline was rendered! 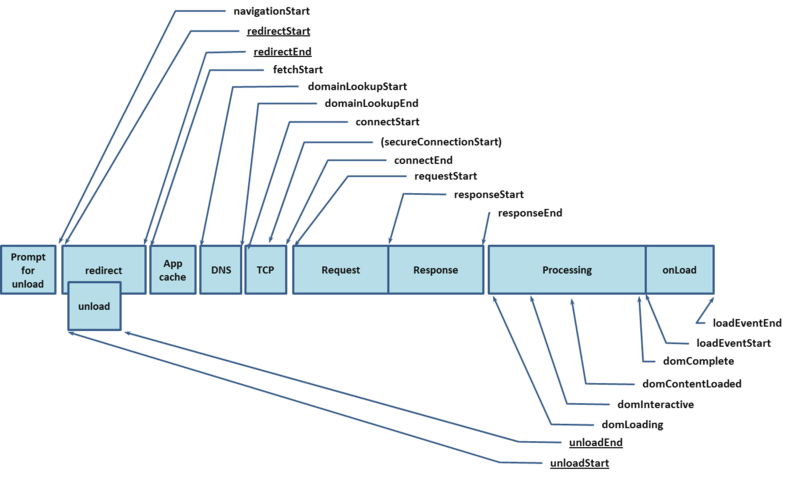 The whole process of navigation and page load: loadEventEnd-navigationStart. Data could also be combined in this way to pinpoint particular problems, for example by calculating the time taken for redirection using redirectEnd-redirectStart. type: the navigation that lead to the page being loaded. Unlike timing tests that use the Date object, the Navigation Timing API can be used in ways that do not affect page load. This makes it extremely useful for measuring page load latency in the 'real world', as experienced by actual users—rather than as tested by a developer using a development computer inside a corporate network. For example, XHR can be used to pass performance.timing data to the host server every time a page is loaded (or unloaded). This produces statistics in real time, but isn't very efficient. Alternatively, timing data could be recorded in local storage for a subset of users for a subset of pages, and periodically packaged and filed to the server. In this way, the API provides a simple way to build up historical data for page performance. Navigation Timing provides useful tools to help developers understand and optimise performance, but the API's most compelling use case is in web analytics, for which it enables rich, accurate and non-intrusive reporting. Better reporting helps us understand page load latency. That should lead to more efficient websites and infrastructure, faster web applications, and a better experience on the web. To get more of a sense of how the API might be used, you may want to try the Page Speed Test extension for Google Chrome, developed by the author of this article. This charts current and historical navigation and page load performance for visits to any page.